Beginning June 1 in Santa Ynez, CA, the iconic guitarist, songwriter, vocalist and three-time Grammy Award-winner will kick off his 2018 “Rockabilly Riot!” Summer Tour. The U.S. dates will hit Sacramento, Napa, Austin, Tulsa, Atlanta, Charleston and Atlantic City, among other markets, before wrapping June 24 in the Boston area at the Lowell Summer Music Series Outdoors (see the full itinerary below). Tickets go on sale to the public on Friday, February 16 at 10:00 AM, local time. Fan Club Presale: Tuesday, February 13 at 10:00 AM local time through Friday, February 16 at 10:00am local time. Be the first to get tickets by signing up for Brian’s fan club here. 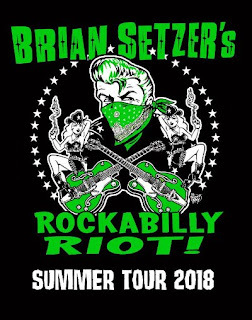 In late 2016, Setzer released his live Blu-Ray/CD package, Brian Setzers' Rockabilly Riot: Osaka Rocka! – Live in Japan, a sizzling rockabilly album from start to finish that highlights the same band.